Over the past week, demonstrations have taken place nightly around the National Diet building in Tokyo protesting the Abe government’s attempt to push through legislation that opens the door for Japan to participate in collective self-defense with its allies, and particularly with the United States. Opposition parties have shown considerable anger with Prime Minister Shinzo Abe over tactics taken to ensure passage of the legislation in spite of public opinion against, as well as the content of the legislation itself. 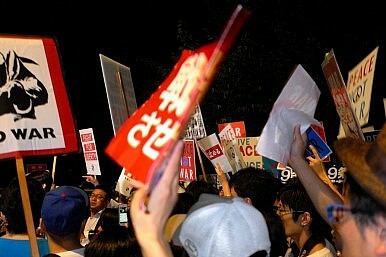 Earlier in the week members of opposition parties held up placards critical of Abe in the National Assembly and eventually walked out in protest. If the legislation is passed, and it seems very likely that it will be, it would allow Japan the right to collective self-defense, a move that significantly changes the current military framework and moves Japan very far away from Article 9 of its pacifist constitution. Japan’s neighbors have voiced displeasure at the legislation and, predictably, China has warned Japan against militarization that it says could destabilize the region. Often lost in the political fray are the feelings and fears of average people in Japan, many of whom have little desire to live in a society that involves itself in war. 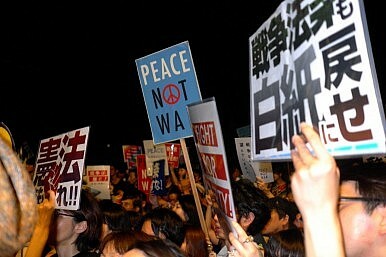 In the evenings around the Diet building, one can see large numbers of people carrying signs in both Japanese and English, most of which are either promoting peace or demanding that the government protect the constitution, and particularly Article 9, which bans the right of belligerency of the state. The crowd is of mixed age, ranging from college students to people in their sixties and seventies. Emerging from the subway station across from the Diet building, the sound of drums and chanting of slogans like “Protect the Children, Stop Abe!” or “Protect the Constitution!” continuously pass though the humid night air. One older man sat holding a sign that read, “Protect the Peace Constitution from Madness!” and then showed the kanji for the Kōmeitō (Clean Government Party that is aligned with Abe’s LDP) crossed out and above that a cynical comment about it being a political party devoted to peace. 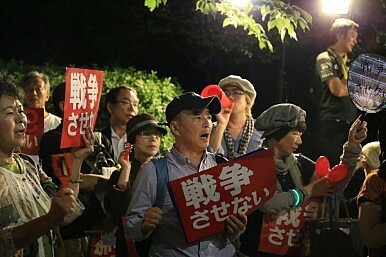 As I walked around the demonstration on one of the evenings, I asked some of the participants about their opinions – in fact a few people, perhaps noting my foreignness, approached me to voice their opinions about Japan, its constitution, and its prime minister. One woman told me that she was not opposed to the Self Defense Forces, but is unhappy with the lack of respect for the attitudes of the public that the Abe government is showing. She said that Abe is interested in protecting Japan as a place, rather than the people who live there. She commented quite strongly that all governments should be trying to protect the people of the world, rather than simply protecting their own lands. Another woman told me that rather than worrying about becoming a normal country – normalization as a political and military power has been a common expressed goal among LDP leaders for some time and is connected to desires among some politicians for Japan to hold a permanent seat on the UN Security Council – Japan should take pride in its unusual pacifist constitution and set an example for other countries based on the fact that Japan is not normal. While much of the anger in the demonstrations has been directed specifically at the collective defense legislation, some members of the crowd were engaged in a more general protest against the Abe government’s perceived lack of commitment to democracy. Several people walked past me with iPad’s displaying the phrase, in English, “This is what democracy looks like.” While others had t-shirts decrying fascism. For people outside of Japan observing these demonstrations and the widespread dissatisfaction with the Abe government’s push for changes in security laws and promotion of the right to collective self-defense, I think two points should be kept in mind. First, the demonstrations going on around the Diet are not only about opposition to war and to legislation that yet again reinterprets the constitution of Japan in relation to security issues and Article 9. There is a widespread feeling of dissatisfaction among protestors with a seemingly brazen and heavy-handed approach of the Abe government and many expressions that Abe is disinterested in the opinions of the electorate. As a result, the demonstrations for some protestors are as much about the nature of Japanese democracy and the current leadership as they are about the specific issues of collective self-defense. Second, there is considerable pride among many Japanese – and I have heard this not only in the context of demonstrations, but also in talking with others outside of the intense emotionalism of protests – in the fact that Japan is very unusual due to its pacifist constitution. While the LDP and its allies have long been pushing for normalization of Japan, there is a very real question of just how normal the population of Japan actually wants the country to be. The unusual qualities of Article 9 are seen by many as something distinctive in Japanese culture and society that sets Japan apart from countries like the U.S., Russia, and China that appear to accept war as a normal part of international relations. And that difference is a source of pride for many in Japan. The demonstrations going on in Tokyo are a call for a different approach from the Japanese government, and particularly the LDP, in which politicians work to promote international peace from a position of leadership grounded in a constitution that rejects war as a right of the state. They are also a demand that the Abe government start listening to the majority of Japanese who do not want further reinterpretations of their deeply valued peace constitution. John W. Traphagan is Professor of Religious Studies and Human Dimensions of Organizations at the University of Texas at Austin.